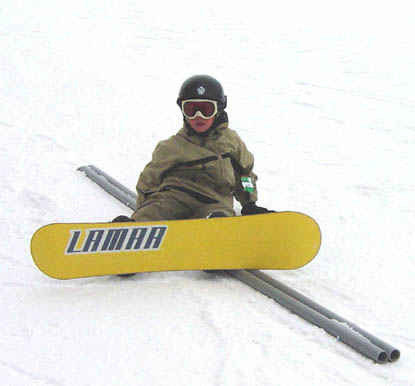 Rails and fun boxes are common terrain park features found throughout most ski/snowboard areas. Many of these features require a degree of riding skill in order to successfully execute a move on the feature. The challenge with teaching such maneuvers is setting up a teaching progression that brings the student along in small enough steps to avoid turnoffs from crashes, and sets up the student for success. 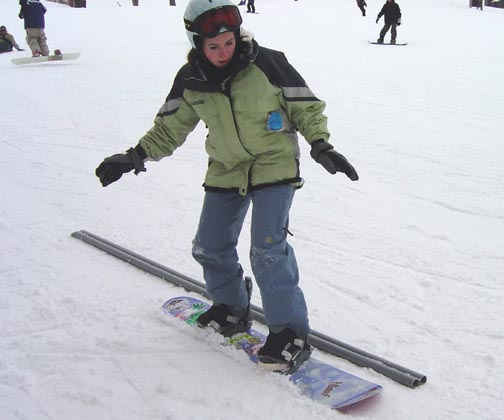 The use of a portable terrain park feature at Wilmot Mountain, WI has helped many beginning terrain park students master basic skills for riding rails and fun boxes. 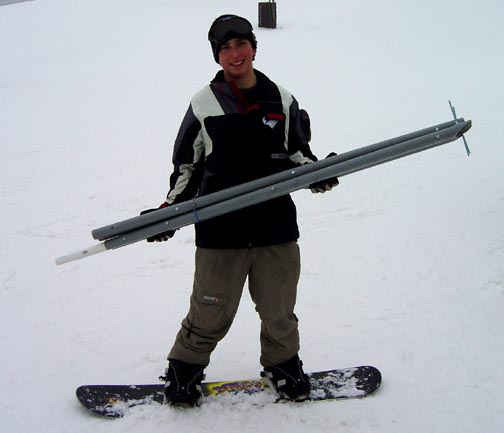 Figure 1 shows the instructor holding the portable device in preparation for an introductory class on riding the terrain park. The feature is constructed of grey PVC pipe, which is carried in 2 sections for ease of transport. The unit is bolted together and placed on the snow with the snow anchors facing down to engage the snow. 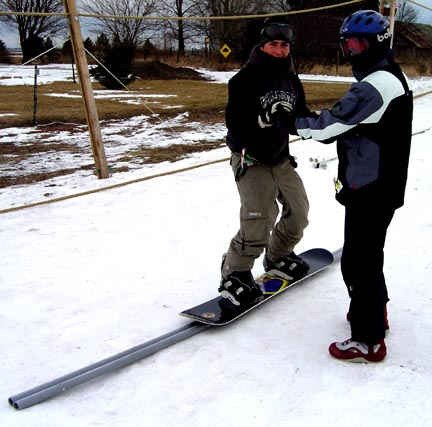 Figure 2 shows the instructor demonstrating how to perform a 50/50 slide on the portable rail, which is about 10 feet long. The device is only used in classes and in a location (with a 3-10 degree slope) out of the heavy traffic lanes. The device should be placed down the fall line since off fall line positions will result in sliding to one side. Rails and fun boxes require a standard reference stance (Figure 2) and an ability to line up the body with the long axis of the feature. 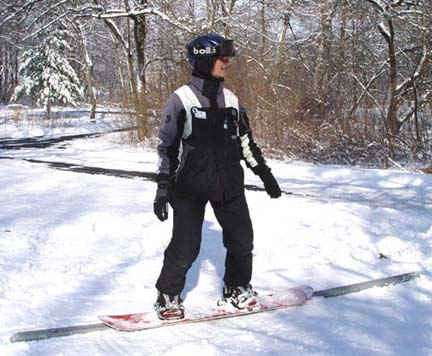 The purpose of the portable feature is to help students learn to line up properly for such a feature and get the feeling of sliding over a surface other than snow. 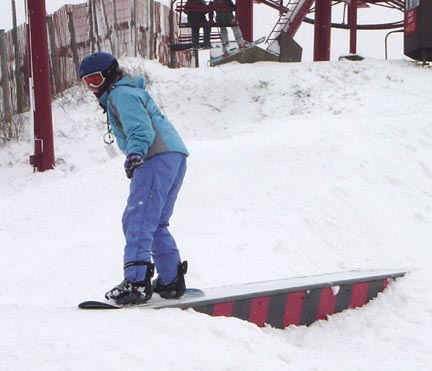 For the beginning terrain park rider, a nearly static run across the rail can be helpful. Figure 3 shows the instructor holding the student by the hands in order to obtain the proper stance and line up. Next, let the student try a 50/50 themselves, as shown in Figure 4. Let them walk up about 20 to 30 feet above the feature, have them buckle in and try it out. Usually, the first try will result in a variety of outcomes. Some will totally miss the feature (Figure 4), but will still experience the benefit of lining up alongside it. Some will get a part of it, as shown in Figure 5. Remind the students to look toward and point their leading hand at the end of the rail for a good line up. With additional practice, the outcomes of Figures 6 and 7 are achieved. Most students are thrilled with being able to ride 50/50 along the total length of the feature. They also learn that attempting to correct a bad line while on the feature will usually be unsuccessful. 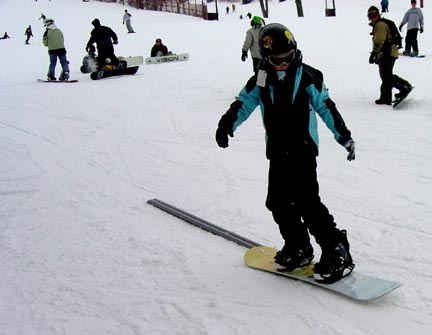 As with most surface features such as fun boxes and rails, attempting to steer or edge will usually not correct a bad entry and may result in a fall. 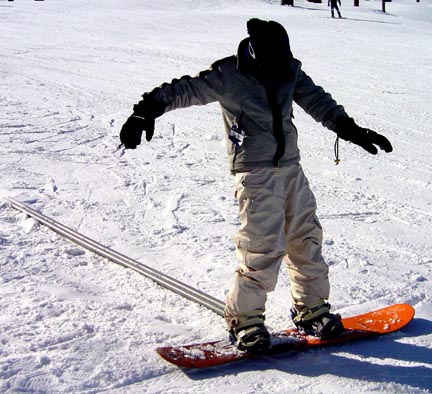 Falling while learning does occur and the consequences are minimal since the portable feature is on the snow, as shown in Figure 8. After several practice runs performing a 50/50 on the portable terrain park feature, the student is now ready for the terrain park. Figure 9 shows a student who successfully rode the fun box on the first try and was truly delighted to be part of the terrain park scene. 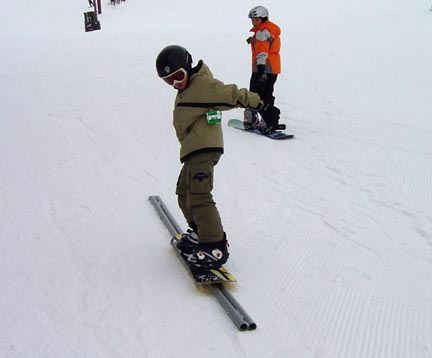 It does not take long before students try boardslides, which also work well on the portable device, as shown in Figure 10. 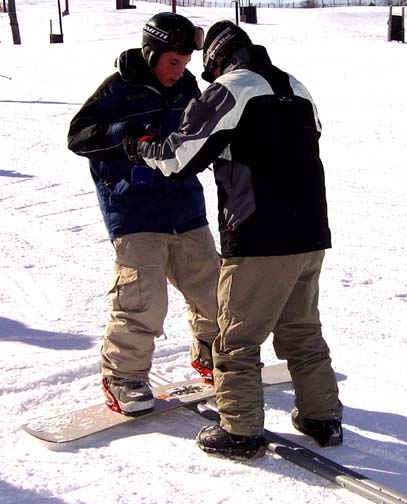 Figure 11 shows the instructor assisting a student’s stance for the boardslide, emphasizing keeping the knees over the toes and proper flexion. 1. Set up the rail on a 3-10 degree slope with the rail pointing directly down the fall line. If students tend to slide off one side more than the other, then adjust the rail more down the fall line. 2. Perform a static exercise by having the student mount the rail in the 50/50 position with the instructor holding hands as shown in Figure 3. 3. After everyone is comfortable with the stance, let each student ride and mount the rail dynamically, performing a 50/50. 4. The class circulates from the bottom of the rail to the top for another try while the instructor performs movement analysis with individual students to help improve technique. 5. When students can perform a 50/50 along the whole rail, they are ready for the easy fun box in the terrain park. 6. Some students may also want to practice boardslides (Figures 10 & 11). A static exercise is helpful where the instructor emphasizes keeping the knees over the toes for a good boardslide stance, with the knees and ankles flexed. 7. Head for the terrain park. 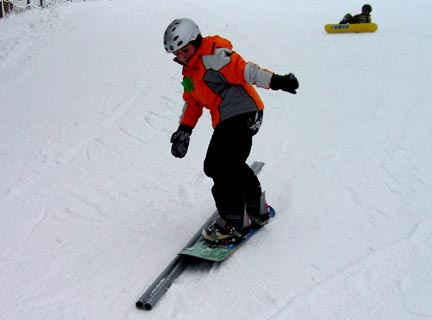 The portable terrain park feature is an excellent teaching aid for introducing beginning terrain park riders to typical terrain park features such as rails and fun boxes. The portable terrain park feature gives the instructor more flexibility in teaching riders without interrupting the flow of the terrain park. Riding the portable feature is less intimidating since a fall is of little consequence. This teaching aid will help set up the student for a successful first pass through the terrain park.